Which one is a fake? I'll tell you it's the one on the right. Here's the bad news: fake diamonds are almost impossible to spot with the naked eye. "There isn't anything you can see or feel to help you tell the difference between a real and simulated diamond, says Naomi Fowler, Managing Director and resident diamond expert at Anna Sheffield Bridal. And here's the good news: the professionals have a whole bunch of tests to make sure you don't get ripped off. Here are five ways they can spot a fake. The electric test: "Diamonds are tremendous electrical conductors, which is one of the things that makes them so useful for industrial purposes," says Fowler. Every jewelry store has a simple device for testing conductivity. A metal needlepoint touches to the stone. If a light goes off, voila… you have a real diamond on your hand. 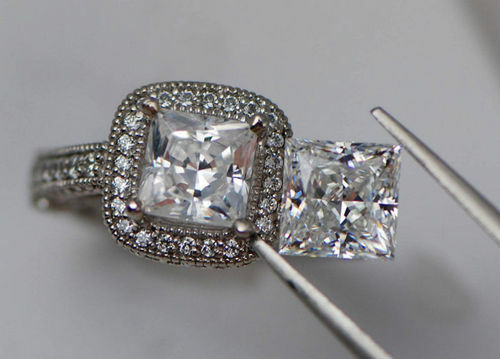 If the light doesn't go off, it's a safe bet you're rocking a cubic zirconia (CZ). The rainbow test: "That prismatic effect that diamonds get, that rainbow?" [Moissanite and cubic zarconia, the two most common diamond simulants] actually throw more rainbows and more fiery stuff than a diamond will," says Fowler. Both are slightly more refractive than diamonds, hence that extra fire. The magnifying test: If you look at the edges of a real diamond, they're always super pointed and crispy. Under high magnification, CZ and other simulates will show abrasions or scratches. The weight test: CZ's are much heavier than diamonds. This gets difficult to measure when the stone is in a ring setting, of course, but experts can identify weight discrepancies. The flawless test: A final giveaway is that fakes look a little too perfect. If your rock has no visible inclusions (spots or flaws), you've probably got a fake. Either that, or you have a flawless diamond on your hands—in which case, congratulations, you can start planning your retirement. For the most part, Fowler says, there's really not much to worry about when it comes to shopping for diamonds; there's very little chance that you'll end up with a fake. "I think a lot of the stuff about buying cubic zarconia on the street is urban legend," says Fowler. "No one's going to be in business for longer than like 20 seconds" if they're selling fakes. So, just stay away from anyone selling an engagement ring out of the trunk of their car, and you should be fine. This post will become very helpful in the near future. I want to design my own wedding ring. Because I am designing it and it going to cost a lot of money I have the idea to use discount diamonds to lower the cost. Although they may be discounted, I don't want them to be fake! Thanks for the post.